Update: Vinod Khosla and I have discussed his claims. That conversation is documented here. Vinod Khosla is an Indian American venture capitalist who is considered one of the most successful and influential personalities in Silicon Valley. He was one of the co-founders of Sun Microsystems and became a general partner of the venture capital firm Kleiner, Perkins, Caufield & Byers in 1986. In 2004 he formed Khosla Ventures. Vinod was featured on Dateline NBC on Sunday, May 7, 2006. He was discussing the practicality of the use of ethanol as a gasoline substitute. He is known to have invested heavily in ethanol companies, in hopes of widespread adoption. He cites Brazil as an example of a country who has totally ended their dependence on foreign oil. There we come to the crux of the matter: People trust that he knows what he is talking about. The Wikipedia biography says he is “successful and influential”. Make no mistake; he is influencing people in this ethanol debate, including political leaders. 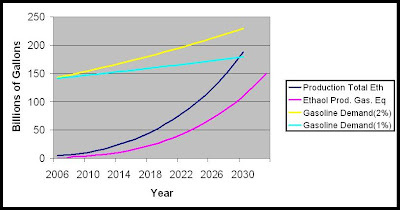 Khosla is convincing people that his projections are viable. Yet, are they carefully scrutinizing his claims? No, because they trust him. Yet claims like his, will dampen conservation efforts, and Americans will not be prepared for Peak Oil. After all, Khosla, a guy they trust, says we are going to produce enough ethanol to replace our oil imports. By the same logic, I can offer you an easy plan for becoming a billionaire in the year 2030. Here’s what you need to do. Increase your salary each year, increase the amount you save each year, and increase your return on investment each year. You will find that your wealth chart looks just like Khosla’s ethanol chart. Of course I could point out that it is extremely difficult to accomplish all of these things in practice, but then you might not buy my new book: “Become a Billionaire in 3 Easy Steps”. Before the debunking commences in earnest, I want to reiterate a debate challenge I made to Khosla. Following his essay at The Huffington Post entitled The Big Oil Companies Have Been Ripping Californians Off — And Not Just at the Pump, I issued a challenge to Khosla to debate his claims. I repeat that challenge here. We can engage in a written debate (so claims can be referenced and verified) hosted at The Oil Drum, or at the venue of his choice. The focus will be on various ethanol claims that he has made. I will show that many of his claims are simply incorrect, and a lot of it is propaganda. Let’s focus on some specific claims that Khosla made in his presentation, and see if they hold up to scrutiny. If they don’t, then I want to ask why anyone takes his claims seriously, and why we are allowing him to influence energy policy. I want to ask those who encounter him to vigorously challenge him on his exuberant claims (and make sure he knows about the debate challenge). Because if he is wrong, and political leaders are betting that he is correct, we will be throwing good money away and wasting time while we could be going after real solutions. Vinod Khosla: Brazil has replaced 40% of their petroleum use with ethanol already. According to BP’s recently released “Statistical Review of World Energy 2006”, Brazil consumed 664 million barrels of oil in 2005. In 2005, Brazil produced 4.8 billion gallons of ethanol, or 114 million barrels. However, a barrel of ethanol contains approximately 3.5 million BTUs, and a barrel of oil contains approximately 6 million BTUs. Therefore, 114 million barrels of ethanol only displaced 67 million barrels of oil, around 10% of Brazil’s oil consumption. In other words, Brazil’s energy independence miracle was 10% ethanol and 90% domestic crude oil production. Therefore this claim, despite being constantly repeated, is false. It presents a very misleading picture of Brazil committing to ethanol, and then farming their way to energy independence. In fact, they drilled their way to energy independence. It also doesn’t hurt that they use 1/7th of the per capita energy that the U.S. uses. If you note Khosla’s slide 4, you see the qualifier “for light cars and trucks”. That is an important qualifier (even though he didn’t mention it), but it still presents a misleading picture. According to a March 2006 presentation by the Brazilian Ministry of Mines and Energy, the actual breakdown of vehicle fuels in Brazil at the present time (by volume) is 53.9% diesel, 26.2% gasoline, 17% ethanol and 2.9% natural gas. At the 5:10 mark, Khosla says “Unlike here, ethanol [in Brazil] has a dramatic reduction in greenhouse gases”. His slide 4 claims a 60-80% reduction of greenhouse gas emissions for Brazilian ethanol. Here he admits that ethanol in the U.S. does not provide a dramatic reduction in greenhouse gases. Why then, on slide 7, does he answer the question “Why Ethanol?” with “Significant Carbon Emission Reduction”? Did he lose track of what he said on slide 4? No, that appears not to be the case. I have heard him make the “significant reduction” claim before. It seems that he is basing this projection on his hope that cellulosic ethanol will deliver according his optimistic projections above. And if we allow him to influence policy, and cellulosic ethanol doesn’t deliver as promised? We are in deep trouble, as you all know. Vinod Khosla: We don’t have E85 pumps. The ethanol is there, the cars are there, we just don’t have any distribution because the oil companies won’t do it. This one left me a bit speechless. The ethanol is there? The spot price of ethanol in California has recently hit $4 a gallon. You can see an 18-month price graph here. Here you have a fuel that is more expensive than gasoline (despite Khosla’s claim to the contrary) while delivering less energy. Why should this be? Because the ethanol supply is not really “there”; not in the quantities needed to justify E85 pumps. You could probably get more ethanol in California, while driving the prices even higher. And “oil companies won’t do it”? Give me a break, Mr. Khosla. You can’t provide enough ethanol to justify them. But I have an idea. You are a billionaire. Put a couple of your own E85 stations in. The oil companies can’t stop you. Based on the logic you have laid out, it will be like printing money. But you will have no scapegoat to blame when things don’t work out according to your unrealistic projections. Vinod Khosla: Even in the U.S., and this is a conservative number, ethanol costs – most of the plants I look at – costs are about $0.90 a gallon to produce. [In contrast, slide 5 says gasoline costs $1.60 a gallon to produce.] Compared to any price you can imagine for gasoline, down to about $35 a barrel, ethanol is cheaper. This is really an extraordinary claim. Khosla is on the record complaining about record gasoline prices. He has used very inflammatory language in criticizing oil companies. He says you are being gouged and ripped off, and that Big Oil is lying to you. So what are we to make of this graph? Say what you want about me. I work for an oil company. You can suspect my motives all you want. But I acknowledge up front that gasoline should not be the basis of our future energy policy, and I acknowledge the problems from wide-scale use of fossil fuels. I advocate conservation and alternatives that make sense. And at the end of the day, I support my arguments. Khosla, on the other hand, is guilty of using some pretty unsavory tactics and making a lot of bald assertions in promoting ethanol (coincidentally, boosting his chances of making money). Vinod Khosla: Ethanol has a subsidy, but the farmer doesn’t get any of that. What I heard, is that well past midnight when this was being debated in the conference committee, the oil companies inserted 2 words into the language, calling this subsidy a blender’s credit. So the person who is blending it with gasoline gets it. All $2 billion of it last year was collected by the oil companies. Like they needed more money. It’s unfortunate, but that’s the way the system works. I talked to one of the senator’s aides who was in the conference room, and he said they got to 1 a.m., and were still negotiating, and oil guys were willing to stay there. This one is chock full of lies, hearsay, and innuendos. First of all, what of the claim that “oil companies inserted 2 words into the language”? Doesn’t he realize that oil companies can’t insert language into a bill? Does Khosla realize that this blender’s credit has been in existence since 1980? Did he talk to a senator’s aide who was in the room 26 years ago when this bill was passed? Does he feel bad about passing on hearsay? (Wait until I tell everyone what I heard about Khosla). Here’s the funny thing about the blender’s credit: Who does it really benefit? You answer that question by looking at the groups who are lobbying to keep the credit: Ethanol producers, farmers, lobbyists for both groups, and farm-state politicians. Oil companies have argued that the subsidy be ended. The credit is designed to make ethanol competitively priced with gasoline. If the blender is getting the credit, they can buy ethanol at $3.50 a gallon, sell it at $3.00, and break even. The credit is being passed on, which is the only reason E85 blends are ever less expensive than gasoline. (However, lately the price of ethanol has been so high that even the credit can’t bring the price into parity with gasoline). If the subsidy was going to the ethanol producers, then instead of selling the ethanol at $3.50 a gallon, they would have to drop the price to $3.00 a gallon in order to move product. In that case, they would pocket the subsidy. Either way, they made the same amount of money, and the cost to the oil companies was exactly the same. Yet Khosla has to paint this as one more way that the big, bad oil companies are ripping people off. I suppose we should just trust him. Vinod Khosla: Corn ethanol has 1.2 to 1.8 the energy compared to the energy in. By the way, petroleum is 0.8, so ethanol is about twice as good as petroleum. Because they always forget to mention that petroleum doesn’t produce a unit of energy out for every unit in. There’s transportation, there’s refining, there’s all those costs. If Khosla’s credibility wasn’t already in tatters, then it should be now. The energy balance of corn ethanol is significantly worse than for gasoline. The 1.2 for ethanol versus 0.8 for petroleum is comparing apples and oranges. They are looking at an efficiency in the case of petroleum, but an EROEI in the case of ethanol. If you want to compare apples to apples, the EROEI for petroleum, even in a poor field, is 10/1 or better. Throw in the refining step, which is also 10/1, and you have an EROEI of 5/1 or better for gasoline, compared to 1.2 or so for corn ethanol. On the other hand, the efficiency of corn ethanol is 20-30% (versus the 80% he mentions for petroleum). If you doubt this, do a simple experiment. Let’s say you have 1 BTU of energy to invest. 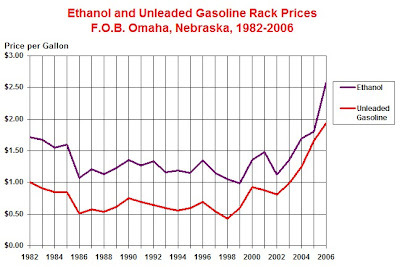 Tell me how many BTUs you will end up with if you invest into ethanol, versus investing into petroleum. Work the problem out, and you will see why Khosla’s claim, repeated by ethanol proponents everywhere, is completely bogus. Let’s recap. Khosla says that ethanol is significantly cheaper to produce than gasoline, that Brazil has shown us the way, that there are “significant carbon emission reductions”, and oh, by the way, it has an energy balance twice as good as petroleum. Yet despite all of those supposed advantages, he is requesting legislation and funding an initiative in California, in order to level the playing field. Who is he kidding? Khosla is trying to hedge his bets. He invests in ethanol producers, and then tries to influence legislation to help out those producers. Yet with all of those claimed advantages, if Khosla believes what he is saying he should spend less time lobbying, and more time building his own cellulosic ethanol plants and E85 pumps. One wonders why he doesn’t. Seriously, if you had a product that is as good as claimed, would you spend any time lobbying for even more advantages? No, unless the product really isn’t as good as advertised. I am a staunch advocate for energy independence. But the core problem is that we use far too much energy. We can legislate and mandate E85 all we want, but we can’t mandate it into existence. Forcing nation-wide adoption of ethanol makes about as much sense as mandating that all 50 states grow mangoes: Yeah, it could be done, but at what price? And is it sustainable? Despite my harsh assessment of Khosla in this essay, I do believe that he deeply cares about energy independence. He is enthusiastic about his product, and charming in his delivery. I just believe he has let his enthusiasm (and possibly his investments) cloud his judgment. I would like to see him take a more critical examination of the claims he is repeating. His presentation slides were slick, but his research, as I documented in this essay, was shoddy. The only reason he has gotten away with it with so many people is because of his reputation, which was forged in an entirely different industry. If oil companies lobby against windfall profits taxes, they are “evil”, and “standing in the way of progress”. But Khosla is lobbying, and his efforts promise to put money in his pocket. Personally, I find this behavior unethical, especially when he criticizes the lobbying efforts of his opposition. I strongly support heavily funding research into cellulosic ethanol. It has the potential, with some technological breakthroughs, of making a contribution toward energy independence. However, counting on it to deliver, while more viable options are pushed to the background, is incredibly foolish energy policy. This is too serious an issue to allow someone like Khosla, who is clearly misinformed (and has a vested financial interest), to dominate the debate. I will not quietly allow that to happen. None of us can afford to. Excellent debunking of myths. I agree with you that Vinod’s charisma and credibility may actually be influencing people more than core data. The question to ask is…if he achieves his objective, will he have delivered a greater good ? Will those half truths be less evil if the end result is cleaner technologies ? BP-DuPont fuel ethanol in your water? Does California use 1500 gallons of water to grow corn to produce 1 gallon of GMO corn fuel ethanol? Does California water providers check for ethanol in the supply water for public consumption? Should California request a waiver of the “Wallet Flushing” ethanol mandate so fuel ethanol ozone is in federal EPA compliance? The California Department of Motor Vehicles (DMV) collects $billions$ using “Wallet Flushing” car tax. Is it time for CA AG Kamala Harris BP ethanol fuel waiver conversation?